Conducted by a health care provider, the program is one of nine organizations participating in an FAA pilot program. 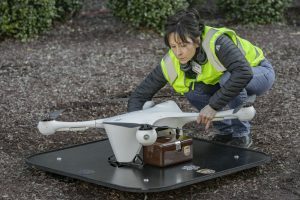 RALEIGH, N.C. — A pioneering use of drones to fly blood samples across a North Carolina hospital campus launched Tuesday in the latest move to expand their roles in business and health care. The WakeMed program will start by flying patients’ medical samples one-third of a mile from a medical park to the main hospital building for lab testing at least six times a day five days a week, Matternet CEO Andreas Raptopoulos said in an interview. Vials of blood or other specimens will be loaded into a secure box and carried to a drone launching pad, where they will be fastened to the aircraft and flown to another building. He said the flights will technically be within sight of operators on either end of the route, and they are authorized to fly above people.